The Dark Souls 3 Prestige Edition and Collector’s Edition has seemingly been leaked via online retailer geekaygames. Geekaygames, a online video game retailer located in UAE has two new editions for Dark Souls 3 advertised for pre-order. 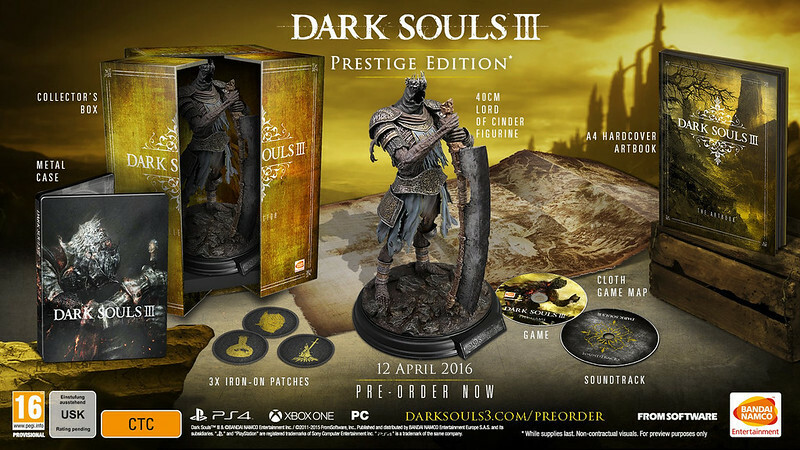 The Dark Souls 3 Prestige Edition is your premium offering and includes a 40cm Lord of Cinder figurine, A4 hardcover artbook, cloth game map, game disc, soundtrack CD, set of 3 iron-on patches, and a metal case, housed in a collector’s box. Geekaygames has it listed at a whopping $1799 AED (AU $695), which I can only assume is a placeholder price tag given the extremely high price for the contents included. A Collector’s Edition for Dark Souls 3 is also available, bundled together with a 25cm Red-Knight figurine, A4 hardcover artbook, cloth game map, game disc, soundtrack CD, set of 3 iron-on patches, and a metal case, also packed in a collector’s box. The Collector’s Edition is priced at $499 AED (AU $$192) and includes all the same contents as the Prestige Edition, with the figurines and packaging being the only differences. Whether or not this is true is yet to be confirmed, but given the website listing I wouldn’t be surprised if it turns out to be genuine. Dark Souls 3 is scheduled to launch on April 12th, 2016 for PC, Xbox One and PlayStation 4.